The perfect place for family and friends to gather. All the comforts of home are included in this 2000-square-foot, three-bedroom, private, vacation home. 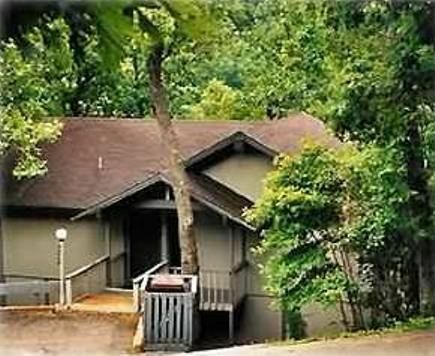 The home is located in Tan-Tar-A Resort on a large lake view, wooded lot providing a cozy, secluded setting. There are no stairs or slopes to navigate to the main entrance from the paved, reserved, parking lot. This is a second home that is nicely furnished and well maintained and you will have it all to yourself during your stay. The lake area is a beautiful area that has something to offer for everyone either in the resort or nearby. You are sure to enjoy the location and accomondations during your stay as we have for many years. The home is completely furnished with a full kitchen and Wi-Fi internet. Each bedroom has two full beds, cable TV, a full bath with hair dryers, etc. Full decks on each level for viewing the sights of nature and the lake, or just relaxing. Half of the upper deck is covered and screened in the event of inclement weather. The home is conveniently located near the, lake, pool, and golf course. You and your family/guests are sure to enjoy your visit and will want to return. To reserve desired dates plan ahead and reserve you vacation or gathering early. Wonderful home and Christmas holiday! We had another wonderful Christmas holiday at this beautiful lake view home. Floor updates were beautiful. All the sliding glass doors gave us wonderful views of the lake. We couldn’t find local tv stations but made due with with net flicks. This is our 4th visit and each one gets better and better. Our family can gather here from Texas, Missouri, and Kansas. We love this place! Location is great, of course, but the sofas and mattresses should be thrown in a bonfire and the entire home needs updating, lighting and redecorating. Great place,great location and reasonable Price.Everyone else are ripping people off on"cleaning fee",Etc.Great owner and honest!! Thank you for the great review. Our goal is to provide an opportunity for each guest to have an exceptional visit. Great stay! Clean and bright. My question how did you make it snow? Twice! Great white Xmas! Our family again had a wonderful Thanksgiving at the lake. The home was perfect and we all enjoyed looking at the lake from the deck. My 93 year old dad even admitted having a good time. We’ll certainly be back. The only issue was that we were not able to use the facilities of the resort because the unit was part of the estates and only people renting the resort were allowed to. That was disappointing.